Lugaflow singer Faisal Sseguya aka Rabadaba will be having his second child with wife Sheila Ferguson in under four months. Sheila who was last seen at Club Rouge on Thursday as they celebrated Rabadaba's 26th birthday was busy showing off her baby bump in a short purple dress. The two enjoyed the night as she smoked shisha with Jack Daniel's flowing till the wee hours. 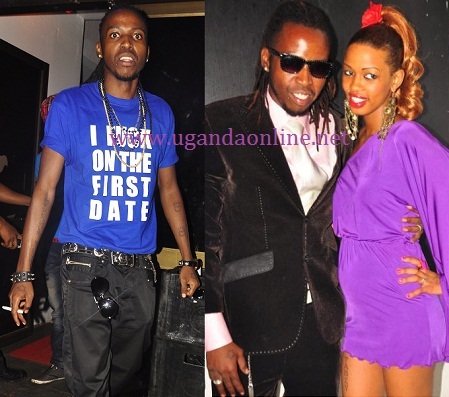 Last year, Rabadaba and Sheila Ferguson had a civil marriage after she had given birth to Kyle Fahim Sseguya and there after, he embarked on plans to travel to UK. Unfortunately, all this hit a dead end when his visa applications did not add up thus being denied a visa. Sources privy to the couple's lifestyle now say Rabadaba will give it another try as he escorts his wife back to the UK where she will be delivering from their second child. Meanwhile, Sheila's back has a 'Rabadaba' tattoo and one arm a 'Kyle' tattoo. This simply means that she will add another tattoo of the new born..Watch this space!